The engine is putting out more than three times the horsepower it was originally built with, and with the highly oxygenated fuel, nitrous and severe use, I have been battling cylinder and piston ring distress for a couple of years. Essentially, whenever I did a teardown, there was evidence of streaking of the Nikasil-lined alunimum cylinder, essentially a scuffing situation that is aggravated by the high cylinder pressures and fuel dilution. 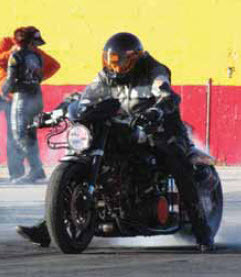 Since Chevron does not make motorcycle oils, I have had to try many of the “other” different motor oils, all synthetic. To make a long story short, I should have read your white paper on motorcycle oil testing. It would have saved me at least three premature teardowns. Bottom line – the AMSOIL 20W-50 Synthetic Motorcycle Oil has completely solved my problems. I have been running it for over a year now, and compression and leakdown have stayed at the exact level as when the engine was freshly rebuilt. This weekend, I tore down the top end to try a new piston ring combination, and the cylinders had absolutely NO sign of streaking or other wear-related distress. Also, all other clearances, including valve lash and valve guide and bearing, have stayed the same. This is truly remarkable. In my training endeavors, I run into a lot of end users who are high performance junkies just like me. I have no problem sharing my experience with the AMSOIL products. In fact, just last month, I gave some lubricant training to 187 instructors at the UTI technical school in Orlando. I made it very clear that I was a big fan of yours. I am having a lot of trouble identifying motorcycle models and engines because the owners don’t know which models they have. For example a Harley rider might tell me he has a Fatboy but doesn’t know the rest of the letters FL ST etc. in the model description or engine size. In the old Powersports Application Guide I could enter the year and make of a motorcycle but leave model and engine size blank and the search would show all models with filter recommendations. The customer and I would then look at the guide together and normally we could figure out what they have. This time the owner is telling me he has a 19 Suzuki Intruder but the current Powersports Application Guide doesn’t show an Intruder model. Would it be possible to modify the Application Guide to allow all models to be shown? To ensure more accurate recommendations, the Powersports Application Guide no longer shows all models; this helps prevent Dealers and customers from guessing when they are unsure. AMSOIL prefers Dealers and customers contact Technical Services when they are unsure. A Google search of “1986 Suzuki Intruder” can help find the call letters and sizes for this model. In this case, the Su- zuki Intruder is also known as Suzuki GL. According to the Powersports Application Guide, there is a 1986 GL 700 and a GL 750. Both require 10W-40 Synthetic Motorcycle Oil and an EAOM134C or EAOM134 Oil Filter. Are oil life monitors accurate when using AMSOIL motor oil? I have a vehicle that has AMSOIL in it with just over 3,000 miles but the oil life is at 46% already. It’s not a diesel. The oil life monitors on most vehicles use a mathematical formula to estimate useful oil life, taking into consideration the miles driven, idle time, frequency of starting and stopping, engine temperatures, etc. They do not test or recognize the quality of the oil. When using an extended-drain AMSOIL synthetic motor oil such as Signature Series or XL, AMSOIL recommends following the oil’s drain recommendations and resetting the monitor if it prematurely indicates the need for an oil change. Because AMSOIL OE is recommended for OEM-recommended drain intervals, the oil life monitor’s oil change recommendations should be followed accordingly. I am interested in the company’s success rate with large independent commercial fleets and municipal fleets. I understand many of these organizations have the “lowest bidder” system in place. I am presently working with a regional power company with over 500 vehicles that does not subscribe to the lowest bid policy. Additionally what about the smaller company privately owned fleets with five to ten vehicles? Although AMSOIL Dealers have had considerable success with the larger fleets, these fleets often work with regional jobbers that frequently provide warehouse space, dispensing equipment, fuel discounts or other specialized perks. Medium to smaller fleets provide greater opportunity for Dealers. They are generally overlooked by the regional jobbers, but are always looking for ways to save money. Amsoil products can provide significant cost savings by reducing annual lubricant purchases, minimizing equipment downtime and extending equipment life. Letters are subject to editing for length and clarity; please include your name, address and phone number. I believe AMSOIL should inform Dealers about drain intervals for customers who use E85 fuel. Since 2003 I have not seen any articles in the AMSOIL Magazine about this issue. I sent an e-mail in 2008 about this because gas prices were over $4 a gallon. Again this year gas has been over $4 a gallon and there are thousands of cars that can use E85 gas. Ford and GM are selling many of these types of cars every day. I was told in 2008 to follow the OEM’s oil change recommendations when using E85 gas because engines run hotter and could cause the oil to break down faster. Also, what about using gas with 10% ethanol over a period of six months as this is the type of gas I buy in Florida. Here in Michigan I can purchase either regular gas or E85, and when gas prices get this high, I like to use E85 as it is usually over $1 a gallon cheaper than regular gas. What would happen if a customer using AMSOIL with the one-year/25,000-mile program purchased E85 every week during the year and didn’t know about using the OEM’s oil change recommendations? Yes, AMSOIL recommends following the OEM-recommended drain interval when using E85 gas; this recommendation is stated on all the Signature Series labels. Use of gas with 10% ethanol does not affect drain interval recommendations. In addition to engines generally running hotter on E85, high concentrations of ethanol increase the likelihood of excessive fuel dilution in the oil which causes the oil to thin out and degrade faster. AMSOIL continues to investigate all issues related to E85 fuel. Some potential commercial accounts I have encountered are frightened of the cost of AMSOIL lubricants, especially in larger volumes such as drums, even after I have explained to them all the hidden benefits of the product. In my opinion, AMSOIL should consider perks to new accounts in addition to them already purchasing products at wholesale pricing. For example, a farm signing up as a new commercial account and after qualifying purchases should perhaps get their choice of one case (or half case of bottles/tubes) of fuel treatment, grease or perhaps three oil sample kits, AGGRAND soil sample kits or other products that might spark interest in other areas of the great AMSOIL product line. In addition to receiving wholesale pricing, commercial accounts also qualify for purchase and freight discounts. Offering further incentives would force either higher prices or reduced commissions. Selling prospects on the cost-effectiveness and many other benefits of using Amsoil products is ultimately the key to gaining new customers and encouraging existing customers to use additional AMSOIL products. Are there any plans for developing AMSOIL apps for smart phones? When talking with prospects, one of their first questions is “how much does it cost?” I try to have many of the items committed to memory, but invariably they ask about something that I don’t have memorized. And, I don’t always have a price list with me. Using the smart phone browser to sign into the current AMSOIL website is just not conducive to giving the customer a quick answer. Another app that would be useful, when calling on a ROTS or commercial customer, would be the ability to scan the barcode of an item and create an order list, something similar to the quick order form functionality, only sized for a smart phone. Having the ability to create a quick list that I can use later to either create the order online or call the 800 number would be a great productivity aid. Also, with the frequency of the price changes we are experiencing, having online access to the current and future prices would enable me to help the customer decide if they should go ahead and order more at the current price. Great job on the new beta Dealer Zone and mobile apps. I already had an opportunity to use the mobile apps today – the same day I got the notice that the new pages had been created to demonstrate the vehicle lookup guide to a new Dealer lead I was visiting. Not only was he impressed at the availability of the information and the amount of information there, but the fact that it was nearly instantaneous on my 3G smart phone. This new mobile app will prove invaluable whether I am at a booth in a trade show, at a customer site or just working from my truck. The new AMSOIL mobile apps were introduced in June and will prove very useful for Dealers. AMSOIL will continue to explore the addition of further apps. Check out all the information on the new Dealer Zone and mobile apps on pages 10 and 11. The column focused exclusively on active regeneration because it is a major cause of fuel dilution. Passive regeneration occurs when exhaust gases are of high enough temperature to cause soot in the diesel particulate filter to spontaneously ignite without the help of a fuel source to start the process. It has been a long-standing AMSOIL policy to have new Dealer applications mailed to AMSOIL for processing. I am sure this is done because AMSOIL wants some type of signature on file. It would be very helpful if AMSOIL could figure out a way to accommodate what it requires while bringing this process into the 21st century. At this time, not even faxed applications are accepted, even though they are for every other type of account. Everything is done online these days, from banking, order placement and even “signing” of real estate documents, all digitally and legally binding. I know other direct marketing companies register new dealers electronically. If there could be a way for AMSOIL to come up with a way for new Dealers to be registered faster than hand-filled-out, mailed paper applications, it would be very beneficial to the existing Dealer network and the new Dealers coming on-board. Thank you for your time. AMSOIL: You are correct that an electronic Dealer application process is in order. That project is in the works right now, and it should be available very soon. Until recently, our attorneys advised against accepting electronic applications and still wanted Dealer applications signed. Recent court rulings, however, have provided more confidence in electronic applications as legally-binding agreements. I have been an AMSOIL Dealer for about 16 years. I use a variety of the filters, oils and greases in my lawn mowers, weed eaters, chain saws and gasoline vehicles. Over the years I have had many vehicles in which AMSOIL was used. Now I have a new way of using AMSOIL. It is being used in a 2001 Ford Ranger that I converted from a gasoline engine to a total electric vehicle (EV). The Ranger was purchased used in 2008. I started converting the truck in June 2009 and began driving it in November 2009. The truck uses twelve 12-volt 140 amp/ hr batteries. They give me a range of 10 to 35 miles, depending on temperature, speed and aggressiveness of driving. I use the EV as my commute vehicle for work. It costs me about a dollar a day to charge. I have an AMSOIL sticker in the back window and have had people say, “You don’t use that in there anymore.” I then tell them how I still use AMSOIL in my transmission, differential, power steering and vacuum pump. AMSOIL greases are used in the u-joints, steering joints and wheel bearings. With GM’s Volt and Nissan’s Leaf, along with all the do-it-yourself conversions, I think it would be a good time to let the world know how AMSOIL is an excellent product for the growing EV market. AMSOIL: Thank you for sharing your story, Scott. It is important for AMSOIL Dealers to realize that although the electric vehicle market is relatively small, it does present opportunity for sales. I use Signature Series 0W-30 Synthetic Motor Oil in my ‘09 Lexus. Unfortunately, it has a cartridge filter, which I have been changing at 5K to 7K intervals. At 25,000 miles, I sent in a sample of the oil to be analyzed. It came back with no antifreeze, but 53 ppm sodium. Does the 0W-30 have sodium in it as part of the additive package? If not, where would the sodium come from, since antifreeze was ruled out? AMSOIL: Like many oils, AMSOIL Signature Series 0W-30 has a trace of sodium, but no more than a few parts per million. Extra sodium in oil can come from a variety of sources, including ocean spray in areas near the coast and road spray in areas where roads are salted in the winter. Car wash detergents and aftermarket oil additives are also potential sources of extra sodium. Even for oils that do not contain sodium as part of their additive packages, 80 ppm is right in the middle of the normal range, and the level has to exceed 160 ppm before it would be considered abnormal. I was impressed with the extensive research that goes into covering the numerous lubricant specifications. I am curious about the process of determining the requirements of a manufacturer’s spec. Do manufacturers provide the acceptance criteria and the tests to meet for qualification? When a product is labeled as meeting those specs, does the equipment manufacturer review the test results? I get a lot of resistance from Honda owners about AMSOIL ATF because Honda has their own specification and wording in the owner’s manual about having shifting troubles if Honda fiuid is not used. Those Honda comments have the owners shut off. Seems to me those customers believe that AMSOIL simply adds the Honda spec number to the ATF label. I have hand-written notes in my 2002 edition G50 Product Selection Guide noting that AMSOIL ATF is okay for Honda Z-1 use, so I can’t pinpoint when the approval came about, but it was some time back. AMSOIL: Yes, in most cases original equipment manufacturers (OEMs) provide the tests and limits that lubricants must meet for each application. AMSOIL products are engineered to meet, and in many cases exceed, the required criteria for every specification listed on the label. In some cases, AMSOIL works with outside entities to test and validate products for difficult-toaccess OEM specifications. This was the case with the recent addition of Honda Z-1 to the AMSOIL Synthetic Multi-Vehicle ATF specification list. AMSOIL Synthetic Multi- Vehicle ATF provides outstanding protection for Honda Z-1 (not CVT) applications. I am going to school in Lake Ozark, Mo. for my Bachelor of Business Management and Associate of Marine Technology degrees. I don’t have the time or funds available to “get out there” as much as I would like. I do what I can though, and have actually been accruing some customers at school. I focused my marketing plan for my Essentials of Marketing class on AMSOIL, and my professor is now switching his and his wife’s vehicles and his boat to AMSOIL. One statement I have heard from a few hard-headed old-schoolers is that synthetics should not be used in older diesel or gas engines, that newer engines are “designed for synthetics.” This usually turns into a pretty heated argument. Engines are and always have been pretty much the same (besides certain differences in performance and quality), and it makes no difference how old the engine is; it can use synthetic oil with the proper prepping. Am I wrong? I’m looking for a little professional confirmation. Maybe I’ve been putting my foot in my mouth, I don’t know. AMSOIL: Congratulations on your success spreading the word about AMSOIL products at school. You are right; as long as the engines are in sound condition, synthetic oils are suitable for use in both older and newer engines, providing clear benefits over conventional oils. I need an educated second opinion regarding what oil I should be using in my 2010 750 air-cooled Ural motorcycle with sidecar. The manual calls for 20W-50, and it only holds two liters. I drive short trips and in city stop-and-go traffic. It never really gets very hot here in Ottawa, Ontario, Canada for long. I feel the best protection for my climate would be to use AMSOIL 10W-40 Motorcycle Oil. Would you agree with this, or what would you suggest? AMSOIL: Unless there is a temperature guide in your owner’s manual that calls for different oil for different temperatures, AMSOIL recommends using the 20W-50 viscosity recommended in your manual. Although AMSOIL 10W-40 Motorcycle Oil would most likely be fine in a cooler climate, air-cooled bikes traditionally need a thicker oil. In the recent announcement of the March 1 price increase, it was stated that our commercial and retail accounts would be sent a letter and be notified in the January Service Line. Would it be possible to publish those communications, and the Service Line, on the website at the same time they are mailed, like is done with AMSOIL Magazine? When I go to speak with my accounts, it would be helpful to know what information, and to what level of detail, they are being provided. AMSOIL: AMSOIL posts the Service Line (click the “Service Line Back Issues” link on the Dealer Zone menu) in the same time period in which it is mailed. The message accounts received regarding the price adjustment matched the message received by Dealers, with the Service Line also providing temporary Account Zone log-in information to ensure all accounts had access to updated pricing files. I have unsuccessfully requested empty grease tubes (GPOR2CR, GPTR2CR) to be used in displays at trade shows so potential customers can see and handle the product. The reason I don’t use the real product is that they will not take the transportation from show to show and they weep over time. Is there a logical reason they are not available? If it is a cost issue, I’m willing to pay for them at a reasonable price. AMSOIL: AMSOIL did at one time offer a program through which Dealers could purchase empty AMSOIL containers for display purposes. It turned out, however, to be extremely labor-intensive. Employees who were normally engaged in more productive work were required to gather the empty containers, drill holes through each (to ensure against re-filling) and arrange for shipping. In addition, demand was very low due to the high cost of the empty containers. The problem was compounded by the assortment of product requests that were received. In the fall of 2010, AMSOIL revamped the look of the Commercial and Retail-on-the-Shelf Account Zones. The new, sleek design looks great! I think the most important new feature is that customers immediately see their servicing Dealer’s name and contact information. Is there any chance AMSOIL would consider giving the Preferred Customer Zone the new look and add the servicing Dealer display feature? I also have another suggestion; I am sure AMSOIL spends a lot of money each month mailing the AMSOIL Magazine to Preferred Customers, as well as the Service Line to commercial and retail accounts. Since the bulk mailer is printing the mailing addresses on the publications, maybe they could also print a line with the servicing Dealer’s contact information. AMSOIL: The enhancements to the Commercial and Retail Zones were just the first phase in a larger project we hope will deliver an improved online experience for all. We are planning several new improvements for both the Preferred Customer and Dealer Zones, and adding the servicing Dealer display feature to the Preferred Customer Zone is on the list of enhancements. We will consider your suggestion on the mailing labels as well. However, AMSOIL encourages Dealers to ensure all their accounts and Preferred Customers already have their contact information on hand and to keep in regular contact with them to ensure all their needs are being met. The Dealer version of the AMSOIL Magazine is very good. I like it very much and I keep almost all my issues. AMSOIL: While staples are the best choice to ensure inserts stay in place, AMSOIL will continue to evaluate other options, including glue dots. I really enjoyed seeing the letter regarding a “high-mileage club” (December 2010)! I am a Dealer in Michigan and a mechanical engineer, and I like that sort of information to assist in the selling process. It really opens some eyes to the advantages of AMSOIL. I also have seen a story regarding a Barracuda that has about 400,000 miles without any mechanical failures. Perhaps that one and others from the past should be available. For the new Dealers like myself, I would like to see an area in the Dealer Zone that allows Dealers to download such articles. This would be a tremendous sales tool that is not being used as it should due to lack of knowledge of previous information. Thanks! There have been some questions about the dexos1 certifications from GM and which oils actually have the license and which just state that they meet the standards. On the official GM dexos site, AMSOIL cannot be found on their list, so there are some questions as to its absence. How do we as Dealers address this legitimate concern? Thanks for the help. AMSOIL OE and XL 5W-30 oils meet dexos1 and API specifications, are API-licensed and carry the API Starburst symbol. They provide excellent protection and performance in vehicles specifying dexos1 oils. I have a customer who has been on CMT/ ABC News because of the type of vehicle he drives and the service he performs with it. It’s a 1942 American La France fire truck which was also on the TV show Trick My Truck. If I got a few pictures and wrote a small article, would it get published in the AMSOIL Hotwire? AMSOIL: It sounds like an excellent story, and we would certainly consider it for publication in the Hotwire or AMSOIL Magazine. Customer Type 4: People who only open their hoods to fill the windshield washer fluid. They often come in to our shops months (I have seen years) overdue for service, and often are so low on oil the red warning light on the dash flickers or is on steady. These are not our regular customers, and if we can convert them to XL or OE, we could get them in on a regular basis and both pick up business and protect their vehicles. Of course if the vehicle may be damaged due to neglect, I avoid picking them up as customers to avoid AMSOIL being blamed down the road for the premature failure that may be imminent due to a poor maintenance history. The new XL 10,000-mile/six-month schedule fits very nicely for the care of the engine, vehicle safety checks, tire rotation, state inspections and related sales. When are you going to reintroduce the new EAO88 oil filter for the Ford Powerstroke? It has been almost two years this spring since it was taken off the market and replaced with SDF88. New customers hear they can go 25,000 miles/one year between oil changes under normal use, but have to use the SDF88 filter which only lasts 7,500 miles. They want the long mileage filter to go with the oil. AMSOIL: The obstacles to the reintroduction of the EAO88 are beyond our control. If there is a change that allows its reintroduction, AMSOIL will do so. I just finished reading “Letters To The Editor,” specifically the questions regarding the EAO09, 10 and 13 (November issue). What about the EAO57? 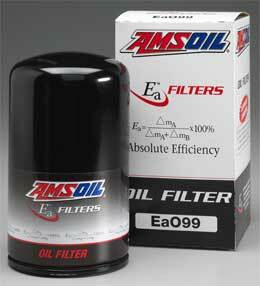 Amsoil: The EAO57 filter was replaced with the EAO51, which has most recently changed to the EA15K51. See page 11 for details on the new 15,000-mile Ea Oil Filter (EA15K) line. The updated marketing plan for selling to out-of-line Preferred Customers requires the selling Dealer to complete and submit a Transfer of Commission Credits Form to AMSOIL INC. The only person who has a financial incentive for the transfer of commission credits is the sponsor of the Dealer or Preferred Customer, who is not doing any work on the transaction, and his or her upline. AMSOIL is asking Dealers to expense money for products, freight, and in some cases taxes, and then receive a 0 percent return on investment when those products sell to an out-of-line registered AMSOIL customer. Did anyone at AMSOIL consider this? Amsoil: While this isn’t actually a new policy, but rather a change in who’s responsible for submitting the documentation, the overall benefits of the policy outweigh the negatives. It is intended to protect Dealers who have personal group members located outside their local areas, while providing viable business opportunities for new Dealers. Remember, Dealers determine their selling price and have the option to add fees to cover costs of freight, inventory, warehousing, desired profits, etc. when selling to non-personally sponsored Dealers and Preferred Customers. Many Dealers also find such sales can help them achieve higher levels of discounts and excellent word-of-mouth advertising from satisfied customers. Of course, Dealers also have the choice to not offer this service if they don’t think it’s profitable. What a great upgrade to the AMSOIL Dealer publication. Pipeline was a great start in the early days; I still have a few. Action News was a long due improvement; I still have a lot of old issues. However, AMSOIL Magazine is a much more professional publication. With its new cover, masthead and articles it provides a new look and more information. Moving the Bulletin Board to the website was a great idea instead of dropping it altogether. Having a place where folks can find meeting locations is necessary; however, it did take up valuable space in the Action News that could have been used more productively. Tech Talk is a good idea. We used to get technical information, but not under a special heading. Will Dan Peterson be writing all the articles or will other technical staff be contributing in their specialties? I especially like the idea of two editions, one for Dealers and a Preferred Customer edition. I hope both will be available for download from the website. My major criticism with Pipeline, Action News and now AMSOIL Magazine is that we get them about halfway through the publication month; I got my December issue on 12/11/2010. Amsoil: We’re glad you like the new publication. While Tech Talk is Dan Peterson’s column, it is likely other members of the Technical Department will contribute material from time to time. You will be happy to know Dealers can download both the Dealer and P.C. editions of AMSOIL Magazine from the Dealer Zone. Just click the “AMSOIL Magazine/Action News Back Issues” link on the Dealer Zone Menu. Because AMSOIL Magazine is sent through bulk mail and AMSOIL has no control over how quickly it is delivered, Dealers receive it at different times, some earlier in the month and others later. Downloading the Magazine from the Dealer Zone provides Dealers a quicker option as it is often posted up to a week or more before it arrives in the mail. I’ve been a Dealer for quite a few years. Although this isn’t my main source of revenue, I have my family and friends using AMSOIL products in their vehicles. I have used the 0W-40 ATV oil in my sport performance ATVs since about 2006. I’ve found out that it has a little higher viscosity than the 10W-40 motorcycle oil which I think would be better for higher temps of the desert. After blowing up an engine, I started investigating more about the construction of an oil. I have worries about the shear stability of such a wide range of viscosity 0W-40. I understand some companies use these VII (viscosity index improvers) to get this kind of viscosity range. The downfall is that these VIIs tend to breakdown quickly and lose the 40 weight viscosity (shear stability). I want to make sure this is the correct oil for me to use for long performance and reliability. I would like AMSOIL to provide better information about this ATV oil and do a white paper comparison to other ATV performance oils. I change oil at 20 hours of use to sleep well at night. This oil might be great for the 4×4 ATVs, but our ATV club has mostly high performance sport quads (700/660 Raptors, etc.). Thanks in advance for more information. Amsoil: Good question, Gene, and thank you for the suggestion. We assume you blew up the engine prior to using AMSOIL. Yes, Formula 4-Stroke® 0W-40 (AFF) is the best choice for long performance and reliability in your ATV. You are correct about the use of viscosity index improvers to achieve a wider viscosity range. However, like other oil additives, the market offers a wide range of quality, and you can be assured that Formula 4-Stroke® 0W-40 is formulated with only the highest-quality, shear-stable viscosity index improvers, ensuring it maintains its protective viscosity and provides second-to-none protection and performance in both recreational and high-performance ATV applications. Your invitation to write has tempted me to tell my history of AMSOIL use. I may not be the first to buy AMSOIL, but I purchased my first case in 1973. At the time I lived in Crystal Lake, Ill., where two of my neighbors were pilots. At the time I was selling conveying equipment and owned a 1972 Mercedes 220 diesel. In Peoria, Ill. in 1973 the diesel would not start at 15 above. I told my neighbor who was an American Airline pilot about my problem, and he said he had a pilot friend in Wisconsin who had an oil that could handle low temps. The Mercedes then started at zero degrees with AMSOIL in it. I have used AMSOIL ever since and been a Dealer for some time, though not very active. When AMSOIL came out with their original grease, I used to lube all my bike bearings with that grease. Without a doubt, I had one of the fastest bikes around. The current grease is too heavy for that purpose. However, most decent bicycles today use greased-for-life bearings. One area AMSOIL could go is bicycle chain oil. While I soak a chain in AMSOIL over winter, in spring I have to clean it well or it will pick dirt and turn black. I ride a TerraTrike Recumbent which uses a very long chain, as do most trikes. Overall there is a lot of chain footage used throughout the world. Thanks for the good work and dedication to your products. AMSOIL: It’s great to hear about your long-time use of AMSOIL products. As far as your bike, AMSOIL recommends Synthetic Multi-Purpose Grease for bicycle bearings (either GLC [NLGI #2] or GLB [NLGI #1], depending on the NLGI grade recommended by the bicycle manufacturer). Both AMSOIL Metal Protector (AMP) and Heavy Duty Metal Protector (AMH) are excellent for bike chains, depending on severity of service, environmental contaminants and desired performance. Heavy Duty Metal Protector does not attract dust or dirt, stands up very well as a motorcycle chain lube and provides even better performance in bicycle applications. I have been using AMSOIL for some time, and I’m also a Dealer. I’m always surfing the web looking for that AMSOIL customer testimonial about a high-mileage vehicle. Will AMSOIL ever have something like that in their magazine? In the past, I’ve seen stories in the Action News about how Dealers have sold customers products and how well they work. I think customers would like to see a “high-mileage club” of people setting records on cars, trucks and powersports equipment. AMSOIL: AMSOIL has published testimonials on high-mileage vehicles in the past, and currently offers a 930,599-Mile Van brochure (G2578) that highlights a 1999 Chevy delivery van that reached its impressive mileage mark using AMSOIL products. Dealers and customers are encouraged to submit testimonials about high-mileage vehicles, and AMSOIL will consider them for publication online or in AMSOIL Magazine. You need a distribution center in Atlanta. When I lived in Las Vegas, I could drive to one and pick up what I needed. When I lived in Florida, I would get what I needed in one day. Now I live in Georgia and it takes days to get what I need out of Richmond. I recently ordered 10 retail catalogs (G100). The shipping cost more than the catalogs. When the catalogs arrived, I saw why. Instead of an envelope, which might have cost a few dollars to send, they were in a big box stuffed with bubble wrap. AMSOIL: AMSOIL does not plan to open a distribution center in Atlanta at this time, but it may be considered in the future. While it appears you live in a 2-3 day UPS shipping zone from Richmond, many variables determine how quickly orders are received. For example, because UPS does not deliver on Sundays, orders placed later in the week can delay delivery an additional day. AMSOIL understands your concern regarding freight costs on your catalog order; however, retail catalogs are among the items with a computed freight cost (see the Literature & Sales Aids Price List [G15]). Regardless of how they are shipped, the computed freight charge applies, based on the weight of the catalogs. A good tip for saving money on freight is combining as much product as possible into one order to spread out the shipping costs. How do you flush an engine using AMSOIL Engine and Transmission Flush? According to the instructions on the bottle, you simply add the contents to the engine oil fill port, idle for 10-15 minutes, then immediately drain the oil. In my opinion, this is a very inefficient procedure because the old filter is full of sludge and other contaminants. So, the flush dissolves the soluble contaminants in that old filter, which then re-circulate throughout the entire engine being “cleaned.” I believe this also reduces the power and effectiveness of the flush itself. Because of this, I always purchase a low-priced generic brand oil filter for the flushing process. This gives any sludge/ contaminants a place to be trapped and held for the 15-minute process, and insures that the full power of the flush goes to cleaning the engine, not a dirty oil filter. AMSOIL: Thank you for your advice, David. Yes, using a new oil filter for the flushing process is a good way to enhance the efficiency and effectiveness of Engine and Transmission Flush. However, the vast majority of soluble materials that the flush is designed to clean are in the engine and transmission itself, while the filters catch mostly insoluble metallic and silicon-based contaminants. Congratulations! The new inaugural issue of AMSOIL Magazine looks excellent! I am very much looking forward to the information and education the monthly Tech Talk column will provide. I just received my latest copy (Oct. 2010) of my AMSOIL Magazine and was reading the “From The President’s Desk” column, like I always do. While reading it this time, an idea came to me. A.J. was talking about “do-it-forme” minded consumers as far as oil changes go and our problems making them understand extended oil change intervals with a quality synthetic product such as AMSOIL. Why does AMSOIL not start a franchise operation on “do-it-for-me” oil change stations? I think it would be a great idea to have an “AMSOIL only” oil change facility. What better way to start educating people on the benefits of extended change intervals while taking care of the “get your hands dirty” part of it for them? This could be a great new franchising opportunity. AMSOIL: Good thought, Danny. This has been a topic of conversation at the corporate level for some time. Although the company is not currently moving in that direction, never say never. Time will tell. We can tell you that we have presented our Dealers with an excellent new tool for further penetrating the do-itfor- me market. I have used AMSOIL since 1980, and have read the monthly magazine for years. One of my favorite articles over the years and still today is the Dealer Spotlight segment. To my disappointment in just looking at the October 2010 issue, I cannot find it. What happened? Maybe I just missed it, but I’m hoping it has not been permanently removed. P.S. I always greatly enjoy Al’s letter also. AMSOIL: You are no doubt referring to the Dealers in Action page. While Dealers in Action is no longer featured in AMSOIL Magazine, testimonials will still be published. Dealers are encouraged to continue their submissions. We, too, enjoy the stories. Usually, I don’t write “Letters to the Editor,” but I just couldn’t pass up the opportunity to relate what AMSOIL, and the AMSOIL products, mean to me and my family. My introduction to AMSOIL came in 1979 at the Southwestern New Mexico State Fair in Las Cruces, New Mexico. I had tried everything on the retail shelf to help my car. This lady got me to try Power Foam in my car and it worked! She and her husband were AMSOIL Dealers Byron and Betty Lady. After seeing how it worked, I wanted to try more AMSOIL products. Will the problems associated with EAO13 applications be resolved? The Mann ML1008 filter does not do our reputation much good. Swapping filters out at a mere 7,500 miles is not the AMSOIL way, and it is the customers that remind me of it. I assure them that AMSOIL is reacting to the situation and will soon have this minor problem resolved. Am I lying to them? Are we stuck with this lesser-grade filter? I know that Mann is a reasonably good filter, but it is not a 25,000 mile AMSOIL EAO Filter. Old habits are hard to break. My hopes are high that you will come up with a fix. P.S. My toughest customer to convert to synthetic happens to use an EAO13. Wouldn’t you know I had to break the news to him about tracking his mileage and changing his filter a couple of times during the oil’s life. Looks bad for me. I have to see this guy at work everyday. AMSOIL: Thank you for your question, Ed. We understand the demand for the EAO09, EAO10 and EAO13 Oil Filters is high, and although several variables are beyond our control, the company has been working diligently to re-introduce them. We are very close and expect to have an announcement in the Dealer Zone and AMSOIL Magazine soon.